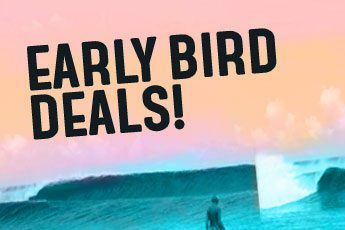 Vaughan Blakey: Your Next Best Surf! When Will It Happen For You? 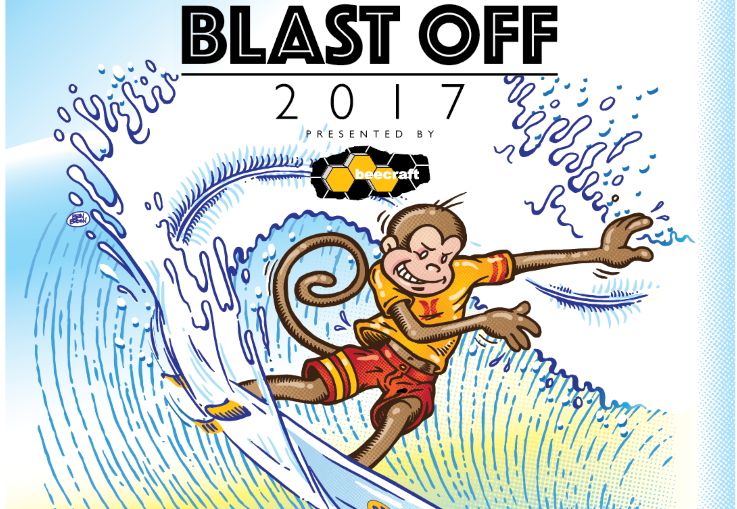 Your Next Best Surf! When Will It Happen For You? “I think that was the best surf I’ve ever had…” Until the next one, whenever that may be. – Vaughan Blakey. Special Guest Blog by Vaughan Blakey, Surfing World Magazine Editor. How many times in your life have you come in from a surf and thought, “Wait a minute… I think that was the best surf I’ve ever had?” If you’re anything like me, (easily pleased, realistic about performance, happy to be out there, old enough to wear a surf hat without being ridiculed) it might be as often as every surf. If you expect slightly more of yourself or your equipment, or of the behaviour of other people in the line-up, or of the conditions… then perhaps those “best surf ever” moments are a little fewer and further between. Regardless of how often or not they happen though, they definitely exist for everyone. However, I was recently reminded that there is a significant difference between sitting in the line-up feeling stoked and appreciative of your surroundings while enjoying a few waves, and having one of those sessions that leaves you in a state of incomprehensible disbelief at what you’ve just experienced. On top of that, I’d somehow forgotten just how spiritual these miracle sessions are. The good fortune involved, the sliding doors decision making that could so easily have steered you away from such moments, and the overwhelming realisation that it could only happen by being in exactly the right place at precisely the right time. These are the surfs that make you feel like your entire life is totally on point, which is a rare and wonderful feeling in this age of increasing self doubt brought on by staring into little hand held rectangles at images and videos of everyone else’s seemingly perfect lives. When I decided to take my woozie to the Maldives recently, the thought briefly crossed my mind that it’d been ages since my last “best ever” sesh. Maybe a couple of years even. It wasn’t like I was surfing any less, but like I mentioned, I was definitely finding joy in the more simple aspects of surfing. Maybe I had become a little complacent about chasing waves that took me to the next level? Maybe I was just becoming surf hat guy? In any case, I mused for only a second because I was actually going there to get engaged, and misplacing the ring before I had a chance to drop the knee was occupying 99% of my brain space. I booked the trip through The Perfect Wave, a long-time advertising partner of SW who had taken Deputy Jennings through the Maldives five years ago on a trip he described as, “The best surf experience of my life.” In fact, we ended up on the same boat Mike had been on, a 127 foot, four storey motor safari yacht with ten cabins, 13 crew, a bar and jacuzzi on the roof, and tender to whip you to and from the breaks in the same amount of time it would take for an average beach camera to load on your phone. If you think it sounds. Suspiciously like I’m giving The Perfect Wave a plug, well you’re right on, but credit where credit is due, after 20 years of doing surf trips this was in an entirely different league. The other passengers were legends, me woozie said “yes”, and Naan the guide got us into six-to-eight foot (legit) pumping waves every single day we were there. I didn’t think it could possibly get any better… and then came the final day. 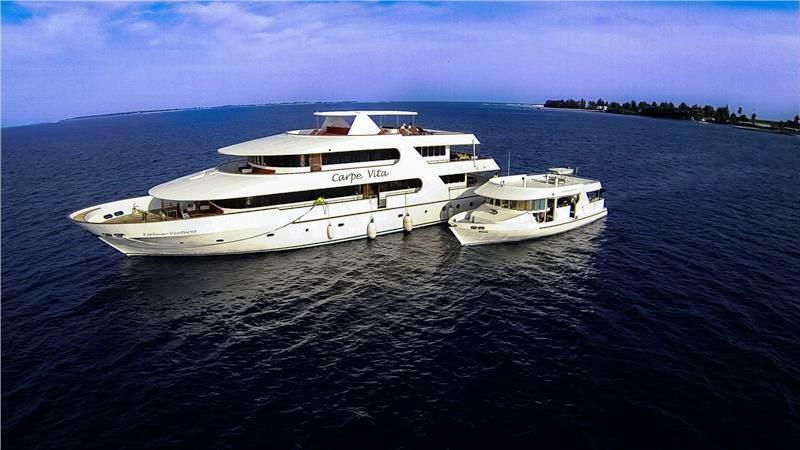 The 127 foot, four storey Carpe Vita with ten cabins, 13 crew, a bar and jacuzzi on the roof, and tender. I’d spent the morning surfing oil glass, six foot Jails with literally three guys out. Just me, my 5’3” Fitzy twin-fin, and perfect empty surf. It was a marathon session and by my standards as good a surf as I’d ever had. No fighting for waves, board feeling incredible; I only came in when the hunger overtook my will to paddle back out. By this stage it was mid-afternoon, and the rest of the crew on the boat were keen to surf something a little more accessible. I’d had my fill, and so we picked up anchor and began motoring back to Male. As the water turned from turquoise to black, the sun lit up the lip lines of waves bashing into the passing reefs, sending showers of glittering gold into the evening sky. We pulled up at a mellow right point and the crew jumped overboard. But just behind us I could see the backs of waves peeling around the edge of a small uninhabited island. “What’s that?” I asked Naan. “It’s a wave,” he replied. “Any good?” He just smiled. We took a dinghy over for a look just in time to see an overhead peak fire across the reef like some sort of work of art. There was not a soul in sight, and instantly, right at that exact moment, I knew this was going to be it. This was going to be the session: Me and two mates, Andy and Americo, surfed this unnamed, unpopulated, accidental slice of perfection till dark, fully aware of what it was we were experiencing, and hooting our own good fortune with every wave we rode. Vaughan Blakey, the editor of Surfing World Mag, loving life on his TPW Maldives trip aboard the Carpe Vita. The frantic romantic shacked in a 14 shot sequence at a secret North Male set up, late in August. – Sequence by Brian James. 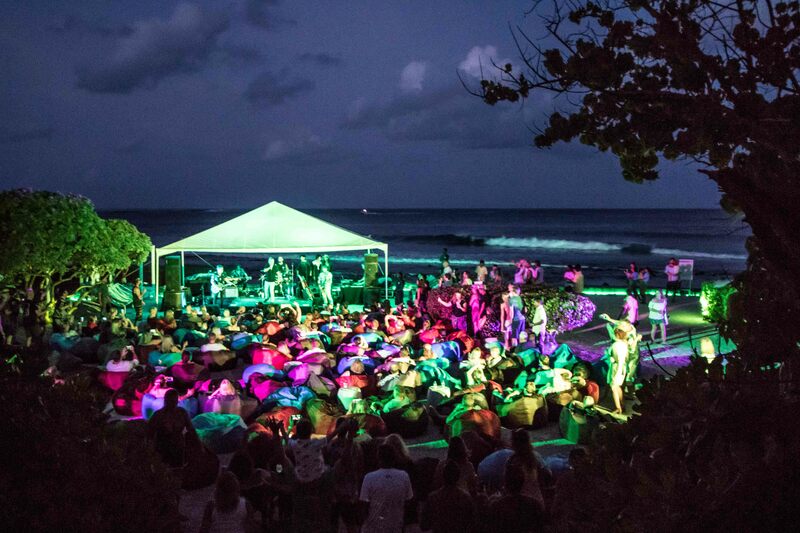 Jimmy Barnes Raised the Bar at Surf Music In Paradise at Kandooma Resort in the Maldives! August & September in the Maldives has been Mental!